(Phys.org) —One key selling point in laptops is battery life and Intel earlier this week had good news on that very front. Its upcoming Haswell processors will give users 50 percent more battery life than Ivy Bridge. That is just one part of what Intel thinks is so great about Haswell. Intel will formally launch the new chips next month at Computex trade in Taipei. Haswell chips are said to achieve low power consumption from a power management unit that provides a view of energy consumption on the chip. It can dynamically adjust consumption in various parts of the chip to reduce the power draw. Faster interconnects on the chip also help reduce power use, according to Intel. Data is transferred more quickly, and so the processor cores spend less time working. 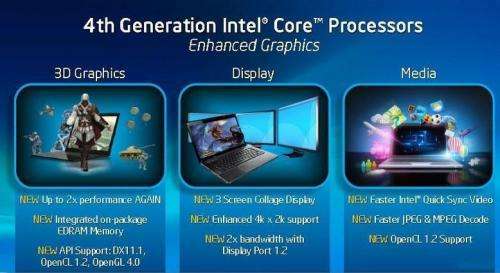 Haswell represents Intel's fourth-generation Core architecture.